What is the definition of true friendship nowadays? Some people rely on their friends for moral and emotional support—to be there when they need them the most. And some base friendship on the strength of their connection and affinity towards each other. But as much as friendship is fluid, it should never be one-sided. It doesn’t only take an outright betrayal for someone to be deemed a bad friend. Here are some subtle but telltale signs your “friend” may not see you as fondly as you see them. Treating you like a soundboard is not what friendship is about. Or any relationship, for that matter. Communication is a two-way street, so don’t feel obliged to hear your friend’s problems out. Because if you don’t feel comfortable enough to talk about your own life in front of them, chances are your friend is a little narcissistic. Narcissists won’t care to know what’s going on in your life because they’re so used to being in the limelight. 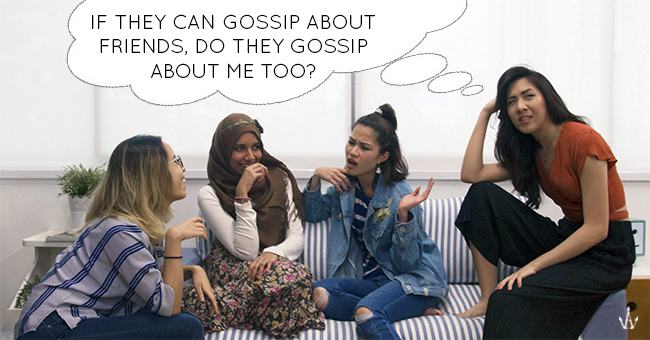 Even if you have nothing specific to talk about, good friends always provide opportunities to discuss concerns because they care about you. They’re not self-centered and their life doesn’t revolve around drama. There’s a saying that goes, “People want to see you do good, but never better than them.” Whenever they congratulate you it feels forced, or insincere. Because they’re always trying to one-up you and undermine your achievements, or devalue your opinions. But jealousy stems from insecurity. So if you sense their distaste for your happiness or inability to acknowledge your perspective, it’s actually their way of feeding their own ego. If you feel like you’re in a constant competition with them to succeed, you’re wasting your time. But real friends stick by and support each other, so try to work things out and explain how you feel. If they don’t reciprocate, you tried. Bye, Felicia. Flakes—these are otherwise known as the grey tickers. You may treasure their friendship and company because you see eye to eye on a lot of things. They’re easy to get along with and fun to be around so hanging out with them feels natural. And you’d consider you guys to be relatively close friends. Except you never know where you stand with them. Because if there’s one thing they can’t do, it’ll be proving to be someone you can count on. You’ve noticed that when you need them to be there for you, or at least turn up as promised, they ghost—like as if they were a figment of your imagination. It always feels like you have to impress them, or put up a front to fit in around them. But as much as you’ve gotten them to accept you, it never feels good enough. And this all-consuming state of never knowing where you stand with them is an—I’ll only say this once—indisputable toxic cycle. Don’t surround yourself with people that make you want to compromise who you are because they make you feel inferior to them. You’ll always find yourself trying to please them because they never seem to appreciate what you have to offer as a friend. They only care about their image and are a self-serving pivot of negativity you should rid yourself of. Personally for me, this is an immediate deal-breaker. Incessantly talking about people behind their backs is not a bonding activity. Alright, you might be thinking get off your high horse. Look, I still enjoy a hot cup of gossip every now and then. But there’s a fine line between discussing current affairs among cliques of mutual friends and mindlessly hating on someone. Especially when they easily bash their own supposedly good friends’ reputations. What makes you think they’re not doing the same to you? Generally, the rule of thumb is: the person that is gossiping with you is the person gossiping about you. Some people you have in mind may display all of these symptoms—if so, TOXIC, I repeat, TOXIC—but sometimes, we can work on it with the friends worth keeping. Even though some friends can be difficult, they might surprise you. Because doing something bad doesn’t make someone a bad person. But sometimes those frenemies of yours were never friends to begin with. So keep these red flags in mind and don’t be deceived by a foe who acts friendly.